Antibody Cross-Reactivity - Wax-it Histology Services Inc.
Wax-it Histology Services provides tissue cross-reactivity services, allowing researchers to investigate and validate that an antibody of interest does not bind to epitopes other than the expected target site. Identification of antibody cross-reactivity in the discovery / pre-clinical stage of drug development can help to avoid adverse and unforeseen toxicological effects in future human clinical trials. Wax-it Histology Services utilizes an in-house TissueMacroArray system to permit rapid screening of potential tissue cross-reactivity. These TissueMacroArrays incorporate multiple arrayed tissues from the same species into a single tissue block, providing more consistent, reliable immunohistochemical staining, and significantly reduced costs (as multiple tissues are stained on a single slide). We first determine the optimal specificity and staining conditions for the experimental antibody. 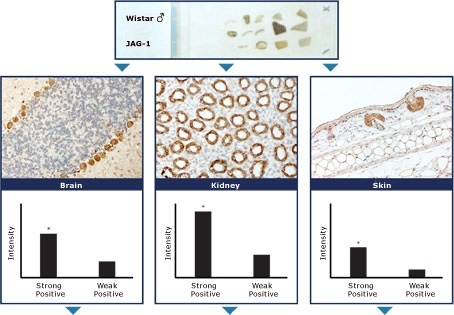 Multiple target retrieval, antibody dilutions, and appropriate positive and negative controls are used to optimize and validate immunostaining conditions. Based on this optimized protocol, we will perform immunostaining across 32 standard tissues, followed by evaluation and report generation. Staining of tissues can be done on an individual basis (i.e. – one tissue per slide), or by incorporating our TissueMacroArray bank into the study. Entire data sets can be collected via digital whole-slide scanning (particularly useful when combined with our TissueMacroArrays), with all stained information being analyzed by a board-certified pathologist and corresponding report generated detailing the findings.